Tıght budgets and sound fiscal management of taxpayer dollars are big in today’s world. It is essential that purchasing managers for cities, counties, municipalities and state agencies make the most of their grounds maintenance budgets. But how should managers approach that? Requests for proposals are time-consuming and expend precious dollars that are allocated in the equipment budget and simply negotiating your best deal is not how government works. What if you could rely on someone else to do the bid work for you? That’s where cooperative buying has a place in a grounds maintenance department. Generally speaking, purchases in these departments are big ticket items that can be a budget buster if you’re not careful. For a grounds maintenance manager looking for equipment to accomplish the job at hand, cooperative buying can mean less time soliciting bids and more time actually doing the tasks associated with grounds maintenance. In 2018, many states and many more cities, counties and municipalities see value in utilizing a cooperative purchasing agency to maximize their limited tax dollars. So how does cooperative buying work? The cooperative buying model is really quite simple. This type of purchasing model allows manufacturers like Land Pride or Kubota to respond to an RFP that covers a need, such as grounds maintenance. Once the contract is awarded to the manufacturers that meet the bid criteria, it permits a large pool of buyers with similar interests to leverage their buying power to get contract discounts on products or services, stretching their budgets. By using a cooperative model, government agencies also save time and effort because the process is simplified for them as the buyer. Take for example a nearby state department of transportation that worked with Land Pride on a recent purchase. 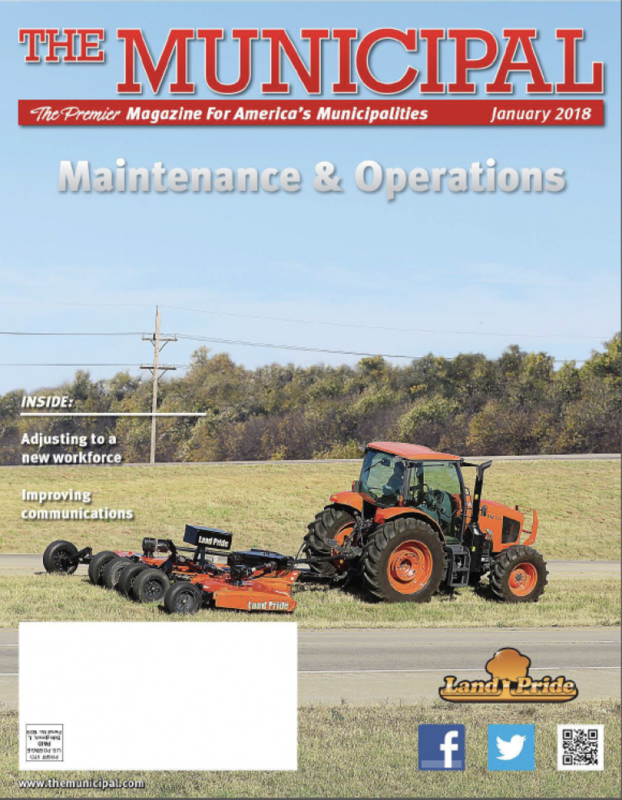 The fleet manager called Land Pride in need of rotary cutters for roadside maintenance. He was looking for a solution that saved him time and money while still getting the brand and model that he and his crew wanted. Land Pride suggested using the National Joint Powers Alliance cooperative-buying contract because the Land Pride products the customer wanted could be purchased easily and at a competitively bid price. In all cases, a dealer is involved for help with setup, delivery and after-the-sale service. In fairly short order, Land Pride quoted the rotary cutters that the state wanted with substantial discounts as outlined in the NJPA contract. The state reviewed the quotes and issued purchase orders, and Land Pride built, shipped and invoiced the state. Within a few weeks, the process was complete. The process was so simple, the state has come back for repeat purchases, maximizing its dollar while getting a quality product. What can cooperative buying do for you? Once a manufacturer like Land Pride responds to an RFP and is awarded a contract by a designated public agency, members of the cooperative can purchase any number of products at substantial discount and membership is usually free. Since not every state, city or county has a need for a fleet of folding rotary cutters, why would your department want to use cooperative buying? Many times, the manufacturer’s complete product line is available on the contract. 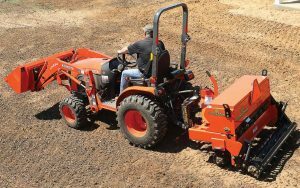 In the case of Land Pride, that’s over 370 Land Pride-branded products as well as Kubota-branded construction attachments, which can be purchased by agencies across the United States. And it’s not just states, cities and counties. Many school districts participate as well. With education budgets in many areas shrinking fast, cooperative buying can stretch dollars further. The BuyBoard is a cooperative located in Texas that has a large number of schools and universities as members. For them, Land Pride’s contract has been very beneficial. In Texas, a school district contacted its local Land Pride dealer in need of a wide-area mower to care for its sports fields and a large tract it was maintaining for future expansion. The dealer sat down with the grounds maintenance manager for the district and discussed needs. Based on the information gleaned, the dealer recommended a Land Pride AFM4211. The district was grateful for the direction in the buying process, was happy with the price and had the mower in time for the spring mowing season. Sometimes in the purchasing process, the need arises to buy an implement and a power unit to operate it. Often times that means two purchase orders, two checks and two manufacturers. Not so fast! Land Pride was purchased by Kubota Tractor Corporation in 2016. That is great news for municipalities that are looking to purchase a tractor implement package. It means only one PO. One check. One great team! 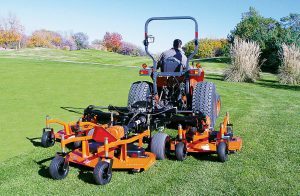 Consider this: A local municipal golf course approached its local Kubota and Land Pride dealer about a seeding solution. 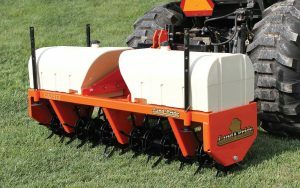 The dealer recommended a Kubota L Tractor packaged with a Land Pride All-Purpose Seeder. The pair were quoted together as a single purchase price for the golf course to consider. After reviewing the quote, the superintendent approved the quote. One PO was issued and one check was cut for a seeding package at a substantial discount thanks to Kubota and Land Pride’s NJPA contracts. There are many cooperative buying groups that government agencies can be a part of. Land Pride offers contracts with several, including NJPA and BuyBoard — just to name two. But with so many cooperative contracts available, buyers need to choose the one that best meets their buying needs. Organizations like NJPA and the BuyBoard make sure everything is transparent. They maintain all of the paperwork and they are competitively solicited, evaluated and awarded by a public agency that is bound by laws regulating the process. Everything is available for public review. By purchasing through a cooperative contract, grounds maintenance managers in many government agencies can take advantage of the timeand money-saving benefits that the contracts provide. Buyers will have to do their homework, but they can certainly be confident that manufacturers like Land Pride are here to help with the process. Finding a contract and manufacturer that you like is better than trying to navigate the buying process alone. Click to download the full January 2018 issue of The Municipal.